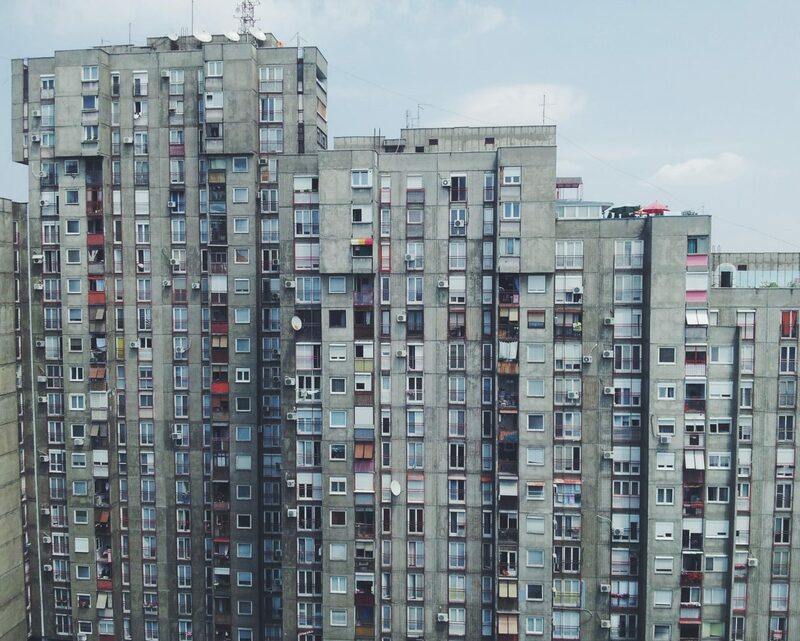 New Belgrade, the youngest of Belgrade’s 17 municipalities, is a real showcase of gritty communist architecture. It’s in complete contrast to the old core of the city located right across from it. This part of the Yugoslav capital on the left bank of the Sava River was envisioned as an embodiment of the socialist ideology. Visually and in the way it was built, it sure was. If you’re curious about Yugoslavia, get ready to be introduced to the best of its signature communist architecture! Let’s start with a small introduction. After World War II destroyed many residential buildings and houses, the Yugoslav government made housing its priority. They wanted to shelter as many people who lost their homes as possible in a short period of time. Therefore, they decided New Belgrade was the perfect place for a new start, as well as for leaving their mark in the city’s history. In 1952, New Belgrade officially became a municipality. Even though it started out as flat terrain, it slowly started developing and blossoming into an urban modern area. Just like it usually was the case in communist Yugoslavia, the construction work was supported by the volunteer Youth Working Brigades. Above all, these Communist Party activists were eager and proud to be a part of their country’s progress and therefore helped build many important buildings (such as the Federal Executive Council). Architects who are most deserving for New Belgrade’s development are Uroš Martinović, Milutin Glavički, Milosav Mitić, Dušan Milenković and Leonid Lenarčić. As the matter of fact, they drafted the city’s regulatory plan in 1962 which included all the previous ideas, solutions and propositions. This is the generation of architects that defined the urbanism and architecture of the new area of the socialist country. 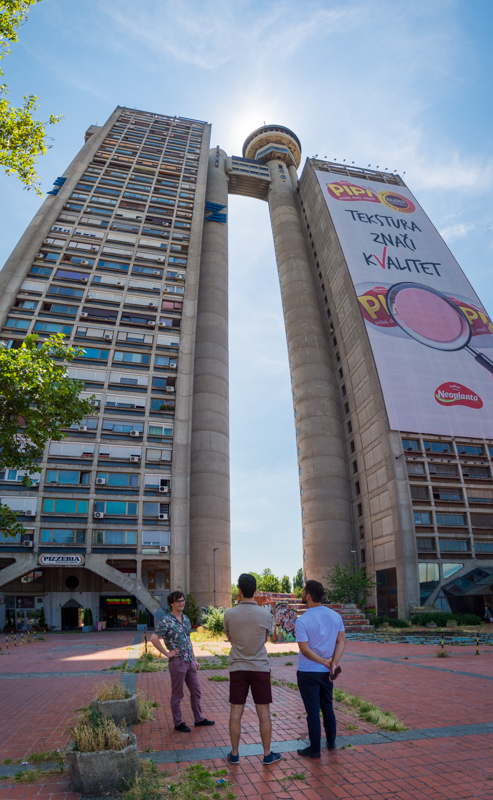 Communist Architecture of New Belgrade, is best described with two terms, Brutalism and Blocks. Perhaps one of the most prominent characteristics of New Belgrade that you’ll notice is its brutalist architecture. Brutalism is characterized by angular forms and rough materials such as concrete, hence the name, which comes from the French term béton-brut (“raw concrete”). Brutalism was inspired by the famous Modernist architect Le Corbusier. Even though many think of it as ugly and monstrous, this style is optimistic for others, since these buildings were built with the best of intentions. One of the ways in which New Belgrade represents the communist ideology is the fact that almost all residential buildings look the same (which is an issue many of its residents are unhappy with). They’re tall, simple and not particularly decorative, but they serve their purpose. So, just like a communist society is a society of equals, that principle is reflected in the architectural aspect as well. Also, the idea of unity and shared space is transformed into shape through these residential complexes called blocks. The recently reopened Museum of Contemporary Art is one of the first buildings planned for this part of Belgrade, since the SFRY was supportive of modern art. It really stands out, mostly thanks to the fact it was placed in suitable surroundings. When looked from the Kalemegdan fortress, which is on the opposite side of the Sava River, it looks as if the Museum is alone in the middle of the forest. The architects responsible for its remarkable design are Ivan Antić and Ivanka Raspopović, who were later awarded for their project. You’ll notice that the main features are the clean, geometrical design and the white marble and glass on the exterior. But, what you might not know is that the six-cube structure of the building determines the walking paths through the museum. Due to its shape and location, the building is often referred to as “the crystal at the confluence”. The Western City Gate or the Genex Tower is the second tallest building in Belgrade. It is actually divided into two towers, one of which is residential and the other commercial. The towers are connected with a bridge on the 26th floor. The architect Mi­haj­lo Mi­tro­vi­ć’s idea was different than the original plan for this building, but he was persistent and did what he wanted to in the end. The building was supposed to consist of only one tower which would be much smaller than the end result. Mi­tro­vi­ć insisted on building the monumental Gate, which he thought was symbolic since it would welcome visitors coming from the Nikola Tesla Airport. The tower is basically an icon of brutalism. Visually, many compare it to the Trellick Tower in London. Just like its English match, it embraces the bare, visible materials and the raw aesthetic. For that reason, many architects consider it to be the most fantastic example of brutalist high-rise. Today, the commercial tower is out of order, as well as the revolving restaurant on top of it which has the most amazing view of Belgrade. However, it’s still impossible to miss and ignore. 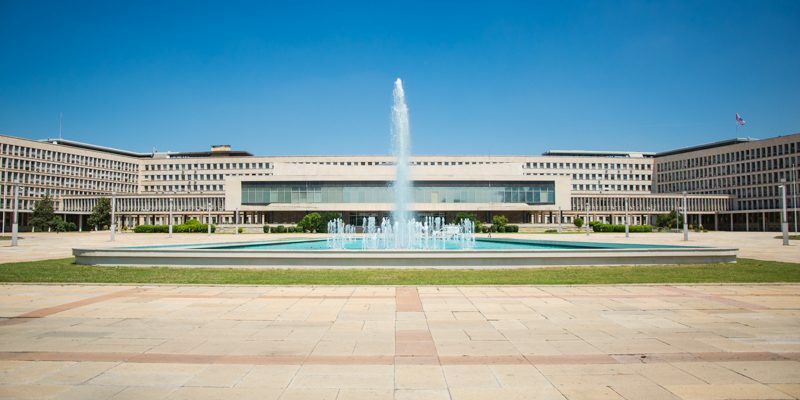 The Federal Executive Council Building or SIV for short is without a doubt one of the most remarkable buildings of the Communist era in general. Vladimir Potočnjak and his architectural team from Zagreb gave the winning design, but the building was finished by Mihailo Janković. This glorious edifice was supposed to represent the Yugoslav power and strength through its appearance. After all, this was the executive body of the SFRY. Therefore, it’s completely different from the unpretentious residential complexes in New Belgrade. As soon as you see it, you’ll know how. The building has a large H-shaped base. It consists of around a thousand rooms and it’s covered in the famous white Brač marble. The interior is even more impressive, since the hundreds of valuable art pieces almost made it into a museum. In 1961, the first conference of the Non-Aligned Movement was held in SIV, as it was the most original modern space in the former Yugoslavia. Walking through the New Belgrade blocks is like stepping into a grey-scale filter. The residential complexes look like sets of cubes, one after another and, just like the name says, blocks of concrete. There is 72 blocks in total. The buildings were made according to the Athens Charter, a document about urban planning published by famous architect Le Corbusier. Among other things, the Charter demands that each housing unit has at least 2 hours of direct sunlight in the winter time and that there should be a certain distance between the buildings. Almost every building is tall and made of bare concrete. However, his model was criticized for creating an isolating atmosphere. Thanks to their skyscrapers, the blocks each hold many residents, which was their main purpose. Appropriately, the area looks just like the council tenancy buildings. Since the issue of repetitiveness is common in this part of Belgrade, you will often find graffiti and murals on the facades, as a way of giving the area some identity. The design of the grandiose building was developed by architects Mladen Kauzlarić, Lavoslav Horvat and Kazimir Ostrogović, winners of a competition held for this purpose. 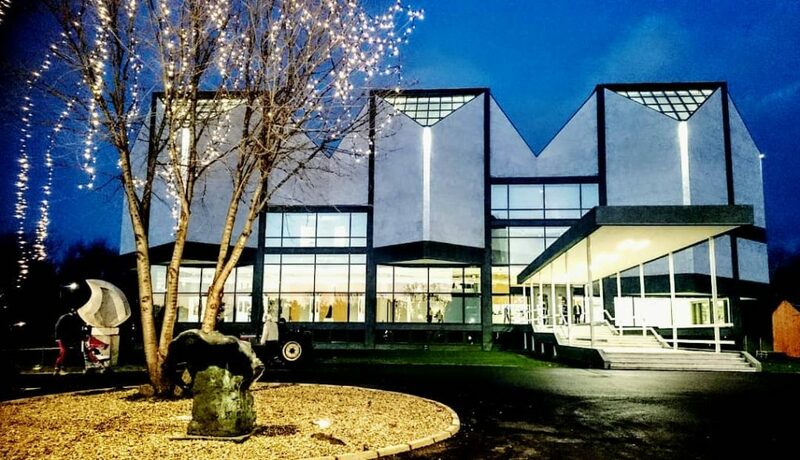 It is a wonderful example of modernist architecture, very forward thinking at the time. This was the biggest hotel in all of Yugoslavia. Its rooms provided accommodation for members of the world elite, such as Tina Turner, Neil Armstrong, Queen Elizabeth II and Presidents Richard Nixon and Jimmy Carter. There are plans of renovating the hotel and completely transforming it, so try to see it in its old glory! Finally, an interesting fact is that one of the most famous museums in the world, the MoMA in New York, is currently preparing an exhibition called Toward a Concrete Utopia: Architecture in Yugoslavia, 1948–1980. Moreover, New Belgrade’s architectural design is particularly prominent in the exhibition, which shows just how unique and influential this period in Yugoslav history was for the entire world. Yeah, visiting the MoMA would be an unforgettable experience. But why not visit these works of art in person? So plan your trip and walk the New Belgrade streets yourself!